These Zucchini Fries are the real deal. I'll admit I was very skeptical when Matt was making them the first time around. I didn't think I would wind up eating all of them. But, guess what? I wound up eating all of them and eating the parmesan crumbs off the plate. My biggest worry was that they would be soggy, but there is nothing soggy about them! Zucchini Parmesan: The Perfect Combo! The coating for this zucchini fry recipe is our cheesiest yet. All you need is some Parmesan and nutritional yeast. It not only coats the zucchini perfectly, but creates a thick and flavorful coating. As you can see below the Parmesan doesn't burn and doesn't fall off. We've created the perfect coating for this perfect keto, guilt free fry! Baking these zucchini fries creates optimal lightness and crunch. Frying them in coconut oil or canola oil is definitely an option for these fries, but that will just soak the zucchinis with unnecessary oil and leave you feeling kinda gross after a couple servings. Baking on the other hand creates a crunchy outer coating while still cooking the zucchini all the way through for the perfect, light bite. When it comes to our recipes that use a Parmesan, almond flour or pork rind coating we always go the baking route. 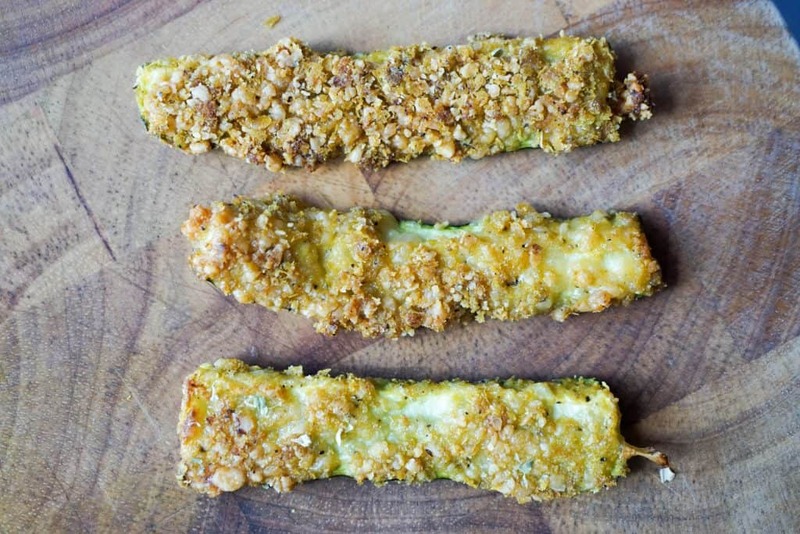 It is our humble opinion that baked foods not only taste better and are better for you than fried foods, but also preserve the quality of the main ingredient, like the zucchini in this zucchini fries recipe. This statement also stands true for our Low Carb Onion Rings and our Keto Chicken Ten﻿﻿ders! This recipe is the ultimate side dish pairing perfectly with a lettuce wrap bacon cheese burger or a bowl of soup. 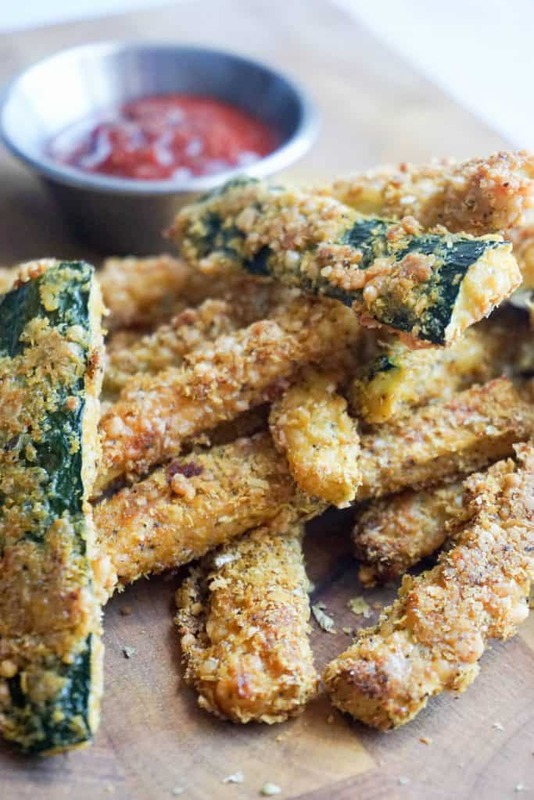 Our zucchini fries are perfect for baking, frying, dipping and eating! 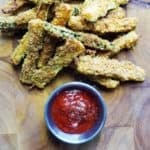 Recipe can be quickly added to MyFitnessPal - Search "KetoConnect - Zucchini Fries"
Cut zucchini into fries (whatever size you prefer) and set aside. In a bowl combine all dry ingredients and mix well. You can omit the nutritional yeast and use double the amount of parmesan cheese if desired. In batches toss some zucchini fries into the dry mix and shake around. Remove coated fries and repeat until complete. One at a time put each fry back into the dry mix and press in the cheese coating to ensure it sticks. Note: the Parmesan doesn't stick as well as the yeast so you want to press it into the fries. Layer onto a baking sheet with parchment paper/silicone mat or onto a baking rack. Bake fries at 425 degrees Fahrenheit. If you are using a baking rack, bake for 25 minutes total. if you are placing them directly onto the baking sheet/mat then bake for 15 minutes and flip over for the last 10 minutes to crisp entire zucchini fry.